Having been thinking, reading, speaking, and writing about “hate speech” over the last four decades, I had come to believe that I had nothing new to say, and that all arguments on all sides of the topic had been thoroughly aired. That view began to change several years ago, as I started to see increasing activism on campus and beyond in sup­port of various equal rights causes. Having been a student activ­ist myself, I have been thrilled by the recent resurgence of student engagement. I have been disheartened, how­ever, by the fact that too many students and others have called for censoring speakers who don’t share their views, apparently believing that freedom of speech would undermine the social justice causes they champion. Anecdotal reports, as well as polling data, forced me to recognize that neither I nor others who advocate robust free­dom of speech, as well as equal rights, had sufficiently explained our position. We clearly had not persuaded many students and oth­ers that equal justice for all depends on full freedom of speech for all. Having watched the video of the whole disturbing CUNY incident, I admire Professor Blackman’s handling of the disruptions with dignity, reasonableness, and a willingness to persist in speaking. But I was sad to see that the slogan-shouting students—future public interest lawyers!—apparently had so little confidence in their ability to express their disagreements via rational discourse. In contrast, I have great respect for the African American student who said he disagreed with Blackman and therefore was sitting in the audience in order to listen and respond to his views. Some of the reasons why Professor Blackman was deemed persona non grata at CUNY Law School also apply to me (despite whatever “liberal” credentials might be attributed to me as the immediate past president of the ACLU). For example, I too have spoken about free speech issues at the behest of the conservative- and libertarian-leaning Federalist Society (whose events are often co-sponsored by the liberal-leaning American Constitution Society, which was founded precisely to serve as a counterweight to the Federalist Society). It is important that we continue to engage in vigorous discussions about the appropriate limits on controversial speech, including what its critics denounce as “hate speech.” While these topics have been perennially debated, we must always consider pertinent new information. For example, recent evidence shows that comparable countries that censor hate speech have experienced no decline in the amount of either hateful speech or discriminatory behavior; to the contrary. Recognizing the ineffectiveness of such laws, many European human rights advocates and agencies are now urging more reliance on America’s approach of counterspeech as the antidote to speech we deplore. Will students and others calling for censorship of “hate speech” and cancellation of controversial campus speakers take heed of these arguments? Despite incidents like the one at CUNY, I have reason to be hopeful. Effective counterspeech has been increasingly utilized by minority students themselves, and by other people who are members of groups that are being disparaged. In addition, resources for countering “hate speech” and bias crimes are abounding, with a wealth of information, train­ing, and organizations that empower all of us to speak up both for our­selves, if we are disparaged, and for others whom such speech targets. Also abounding are non-censorial measures for curbing the potential harm to which constitutionally protected “hate speech” is feared to contribute: discrimination, violence, and psychic injuries. To be sure, campuses and other arenas in our society must strive to be inclusive, to make everyone welcome, especially those who traditionally have been excluded or marginalized. But that inclusiv­ity must also extend to those who voice unpopular ideas, especially on campus, where ideas should be most freely aired, discussed, and debated. Encountering “unwelcome” ideas, including those that are hateful and discriminatory, is essential for honing our abilities to analyze, criticize, and refute them. Featured image credit: “black-microphone-64057” by freestocks.org. CC0 via Pexels. Nadine Strossen is Professor of Constitutional Law at New York Law School and the first woman national President of the American Civil Liberties Union, where she served from 1991 through 2008. A frequent speaker on constitutional and civil liberties issues, her media appearances include 60 Minutes, CBS Sunday Morning, Today, Good Morning America, The Daily Show, and other news programs on CNN, C-SPAN, Fox, Al-Jazeera, and in Australia, Britain, Canada, France, Germany, Italy, and Spain. Her op-eds have appeared in The New York Times, The Washington Post, The Washington Times, and USA Today, among others. 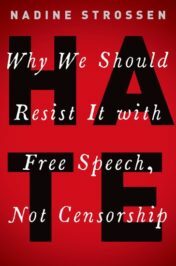 Nadine is the author of HATE: Why We Should Resist It with Free Speech, Not Censorship, published by Oxford University Press.